100 years ago a woman was born who would revolutionize the way Americans eat, thank you God! Living in Charleston SC is a treat, since we have such a wonderful collection of fantastic restaurants, all having been influenced in some way by this delightful woman. Her book Mastering the Art of French Cooking was first published in 1963 and lives on today through recipes recreated by capable chefs and not so capable cooks like myself. In the spirit of Julia, some friends and I decided to visit the popular local french restaurant Rue de Jean which was offering a Julia Child commemorative menu. 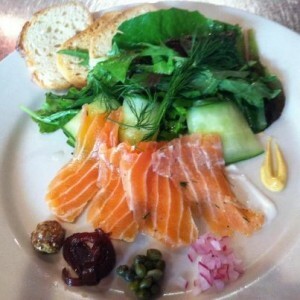 The appetizer, cured salmon gravlax, featured cucumber ribbons, that were listed on the menu as pickled, but weren’t. The large mound of greens next to the salmon were undressed and straight from the fridge. There was a tiny assortment of condiments to use, which were awkwardly plopped on the plate like paints on a palate, a spot of dijon, a tiny drop of cream fraiche, four little capers, a half teaspoon of pickled onion…A real uh-oh moment for the diners who came to celebrate the life of a culinary goddess. The entre was a bit better and we all enjoyed the duck leg and thigh, which was well prepared, but I have to say, no great feat with a sauce reminiscent of apricot jam. The potatoes tasted like a mix, I hope that was just my imagination. I was really looking forward to dessert. The Gateau Paris Brest sounded so divine, hazelnut cream filled choux pastry. Unfortunately, the pastry was freezer burned which ruined the whole production and the filing tasted ready made. 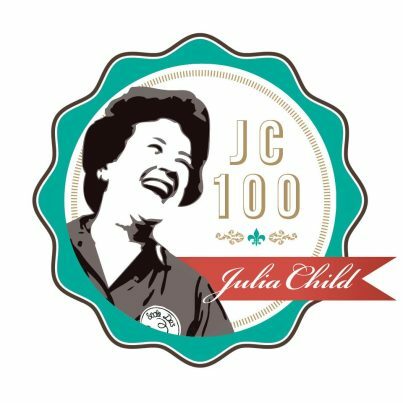 I hate to pan a restaurant on Julia Child’s birthday, I would much rather write about what a great experience we had. Unfortunately, like Julia, I have standards and Rue de Jean did not live up to them last night. Next time, I’m going to La Forchette when I have a desire to sample l’art de la cuisine française in Charleston South Carolina.